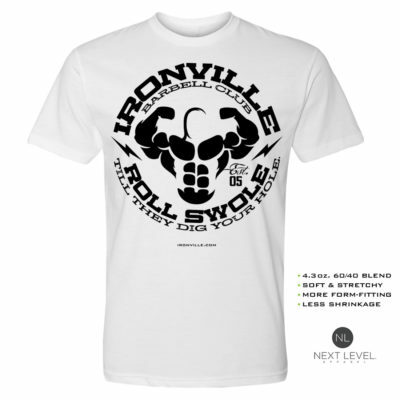 The first of our powerlifting series, the infamous Ironville bench press club shirt lineup. As a lifter in high school, you might recall your football coaching staff offering milestone bench shirts for lifters that climbed the ladder to an ever heavier bench press. This is what motivated us to bring a series to the Ironville table, although it will literally translate to hundreds of possible options. For lifters that bench 200, 300, 350, 400, 450, 500, and 600, we have a bench club shirt just for you. And we’re not stopping there, as we’re now offering club shirts for both squat and deadlift. We gotta keep our powerlifters happy!